But there were some issues for me. I had my seamstress take 4 inches off each side of the skirt, as FP is famous for having tons of fabric where less might be more…plus it’s sleeveless…off white…and falls right at the knee. …as if the gorgeous embroidery wasn’t enough in the first place! Linking with Patti for Visible Monday @ http://notdeadyetstyle.blogspot.com/. ~ by admin_aef on April 21, 2013. This is a gorgeous dress and you wear it very well! 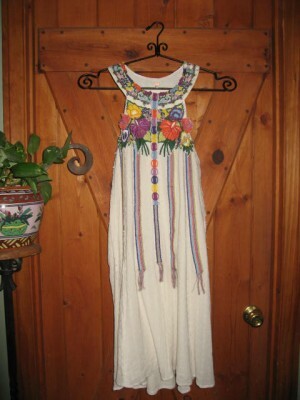 You would fit right in with our Fiesta this week in San Antonio..this is the perfect dress for it…if you want to see more..just come on over to my blog…have a wonderful week! This is a perfect dress for an artsy event! I like how you paired it with leggings! It looks great on you! 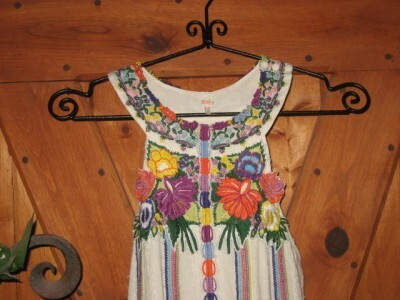 O’ my I would have purchased that dress for the embroidery alone, that is beautiful artwork. Definitely lots and lots of potential. I love the ensemble with the leggings and denim jacket, its perfect with that art piece. You are true Free People gal! I love this dress especially the lavish embroidery.. great buy! Very pretty! Lovely details and you styled it well! I like it with denim and legging very much! I love a girl who knows what a good tailor can do to a great garment! I like the way you think – and I love the altered dress on you! Love the embroidery dress. It’s awesome for Spring. The leggings are a great addition, especially this time of year…love it! I love dresses with embroidery, own a few myself. Yours is really beautiful. 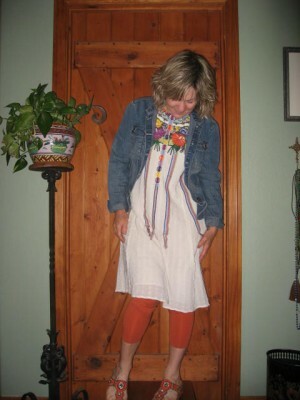 What a pretty dress, and I like it with both the cardigan and the denim jacket. I’m visiting from Visible Monday – think I’ll have a little look around and see what else inspires me! Gosh what a beautiful dress, it looks so lovely and summery on you! Popping by as a fellow Visible Monday blogger, do pop by my post and let me know what you think! Tons of potential. Love that you also took it up at the shoulder as well … I often do that as I’m so short waisted! Pretty you, and you can wear it lots of ways … all summer long! This is a great example of making something work. I love the dress, and the way you styled it makes it totally cool but also figure friendly. Fabulous.